Hey Everyone! How’s your October going? ??? I’ve been really into “cooking the seasons” on Life’s Little Sweets lately, which has been fun and a great way to enjoy the seasons. An example of this would be my last #FoodieMamas recipe post, Halloween Fruit and Nut Chocolate Mummy Bark. 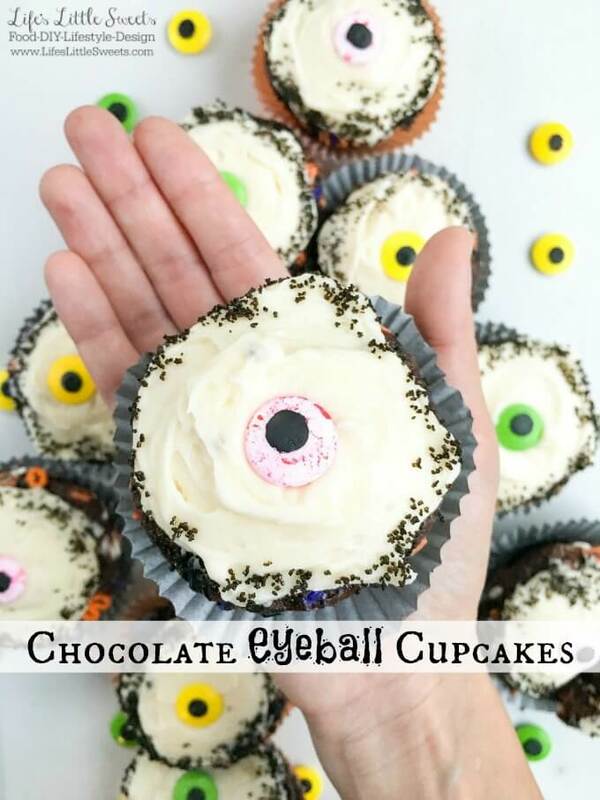 I recently contributed this Chocolate Eyeball Halloween Cupcakes recipe to the SoFabFood blog for the Halloween season and I am sharing about it here on LLS as I usually do when I do a guest post there. Believe it or not, this is the first cupcake recipe that I have published, I find it strange that I haven’t done more cupcakes since I love doing dessert recipes. I love watching “Cupcake Wars” with my nieces when I visit them and my daughter has been asking for cupcakes more and more, so chances are you will be seeing more cupcakes come across the blog. I love that cupcakes are an individual serving and a chance to be super creative. Just a warning, this is a “frosting lovers” cupcake recipe, so those of you that enjoy the corner piece of cake with all the frosting or could lick out the bowl of frosting – this is the recipe for you. If you are not as keen on frosting, feel free to dial it back and just frost the top, as I explain in the recipe post. These Chocolate Eyeball Cupcakes are great along with coffee or a big glass of milk. This recipe is inspired by a cake recipe already here on Life’s Little Sweets. I slightly modified the cake part of the recipe from my Chocolate Orange Almond Cake (DF) recipe and it has a new cream cheese frosting recipe which is very tasty and flexible in that it can be used for a variety of desserts – definitely a keeper! ? So does anyone have any Halloween plans? What are your Halloween traditions? My husband Eric’s Birthday is in October so we have multiple activities this month surrounding Halloween. What’s your favorite Halloween dessert or type of cupcake? Let me know in the comments below!